Every Friday in Lent I do my best to abstain from eating meat. I try to make heart healthy meals for my family all the time, but meatless Fridays make it even easier to get the kids to eat the veggies I put on the table. The ingredients are always best in any dish when they are fresh. We had a quiet Holy Week this year, because we opted to stay home instead of travel to Marinduque like we always do. Nino has been quite busy with work as of late and the “staycation” was a welcome respite from all the business that came before Easter. Easter officially marks the beginning of summer for me, as I know that this means the kids are really done with school. Throwing this dinner together when it’s just too hot, was all I could do on Good Friday. It was a good Friday indeed. Quality time spent with the family, reflecting on all of our blessings. And summer means it’s hot. When it’s hot-it’s also not the best cooking weather for me. I’ve been known to grill everything (veggies included) when I don’t have any help in the house. It makes for easy clean up as I don’t have to wash any pots and pans! But this Good Friday it was exceptionally warm. And I didn’t feel like standing in front of the grill all afternoon, so I threw the vegetables in the Philips Airfryer after tossing them in olive oil and salt and pepper, and decided to make this light cheesy zucchini dish the focus of our dinner. 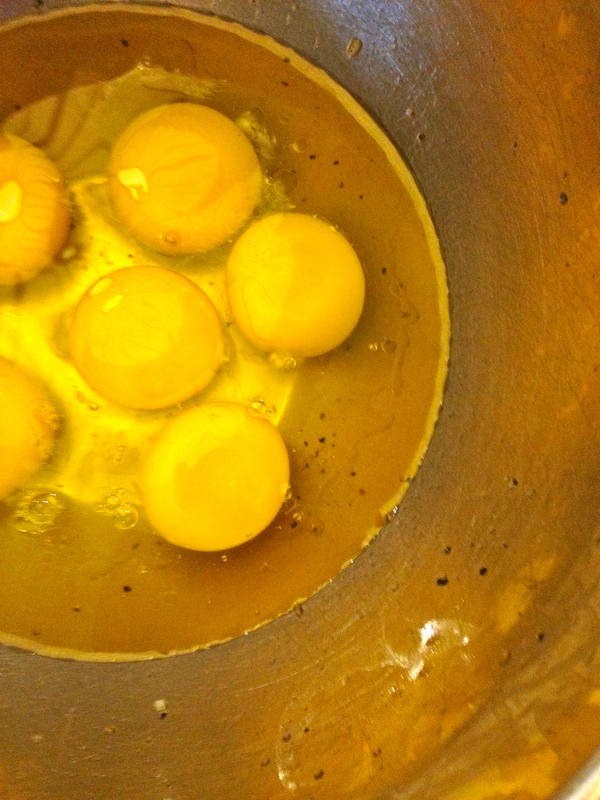 After you beat the eggs, add a dash of milk, just like you would for a scramble. It actually takes more time to chop and prep all the ingredients than it does to cook it! I served our zucchini tomatoes and eggs with garlic bread that I prep ahead of time and asked one of the helpers to toast. (You can actually grill garlic bread too-it’s even better.) On a side note-when you buy french bread and you are sure you cannot finish it while it’s still fresh, we slice it up and add garlic butter right away. Put it in a ziploc baggie for the freezer and freeze! Then when you want to serve something with a side of garlic bread all you have to do is take it out and toast! But of course…the star of this dish is the cheese. Everything tastes better with cheese. And to think…you might not even know the star is in there, if you didn’t see it go in or you didn’t prepare it yourself. While this is a dish I have had many times, done by a few different cooks (Auntie Anne, Nana, and my friend Dana) the recipe I’m sharing today is adapted from one of my favorite cookbooks, Elodia Rigante’s Italian Immigrant Cooking. This is probably my most favorite cookbook that I own, and the story behind it is sweet. I was student teaching in Ithaca, New York, many years ago. It was my first student teaching placement and my master teacher, Priscilla, saw how much I enjoyed the cookbook in the faculty lounge where we would eat lunch. At that time, book sellers would leave books (of all sorts) in the lounge for us to leaf through and order if we liked. I shared with Priscilla how many of the recipes that were in the cookbook were dishes that my Nana would make for me when I was growing up, and at the end of my placement, she not only gave me a stellar recommendation, she also gave me a parting gift that is cherished and still with me today. I hope you enjoy this recipe as I adapted it. 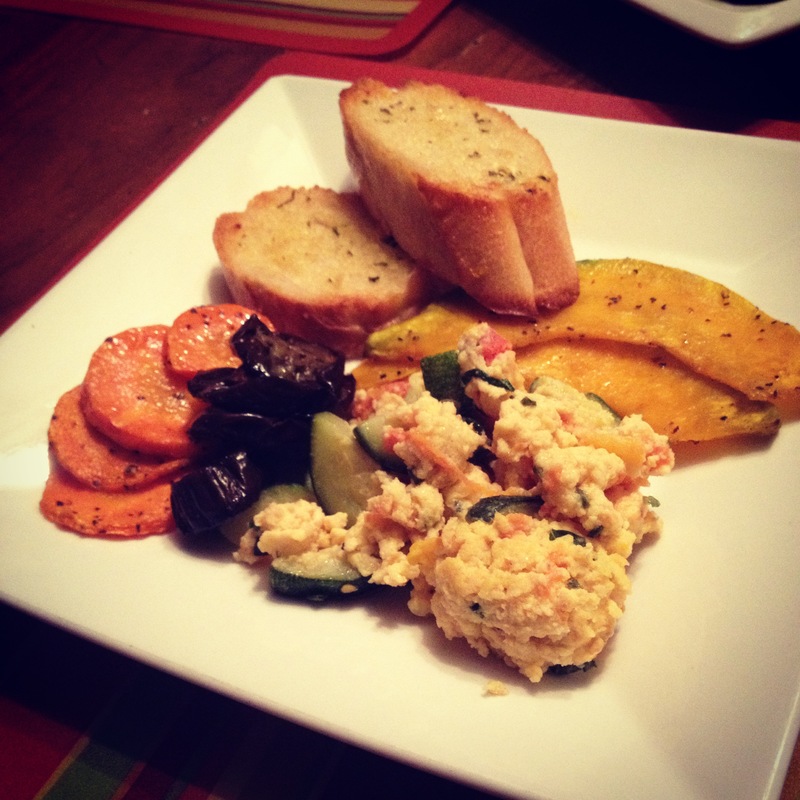 This dish a like a vegetable scramble so there’s no “wrong” way to make this dish. It’s easy, tasty, and perfect for a warm summer day. Make sure to scroll all the way to the bottom for quick IG video on how to make this dish. The key ingredient which gives this dish the burst of flavor is the cheese. Since moving to Manila almost 8 years ago, I have always found that Perfect Italiano Cheeses are the closest to what I am used to using in my cooking and baking. They are fresh, have great taste and are readily available in supermarkets, making it easy for me to shop in one place for all my cheesy needs when I do the food shopping. This is an easy summer dish that can be paired with some crusty bread. 1. Heat up the olive oil in the pan and saute the minced garlic. 2. Add zucchini and cook until just tender. 3. Add tomatoes and cook until just tender. 4. 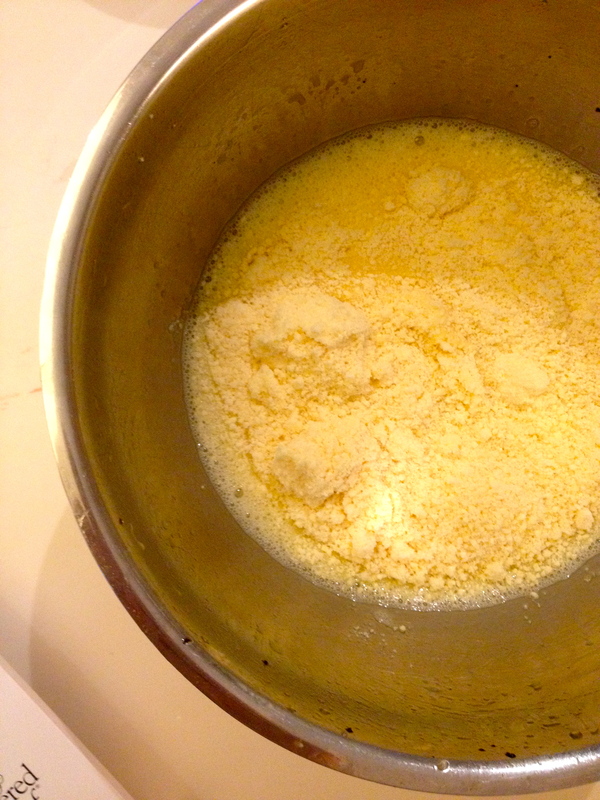 Mix 1/2 grated Perfect Italiano Parmesan Cheese into egg mixture. Season with Salt & Pepper. 5. 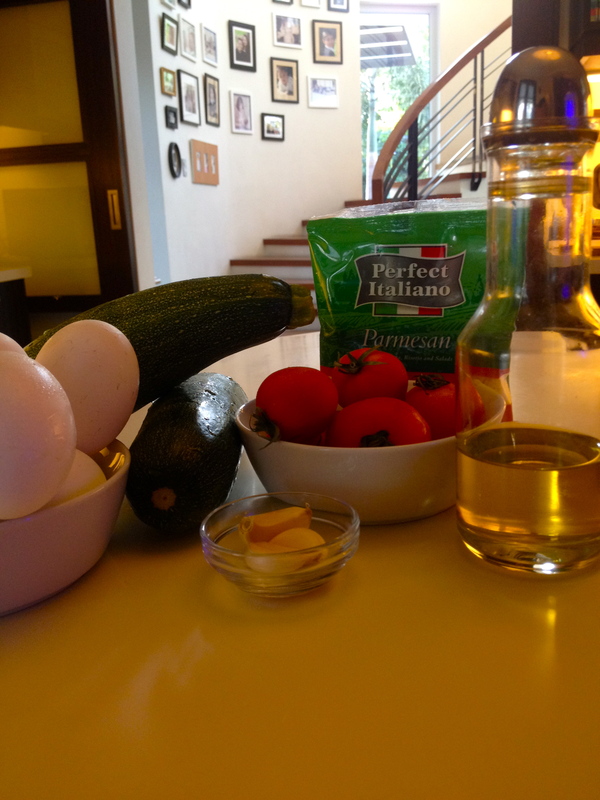 Mix into the zucchini and tomatoes and scramble to preferred doneness. 6. Serve with warm crusty bread. Perfect Italiano has tons of fun recipes on their website and their Facebook page. Check out both of these places and back here for more fun ways to create delicious and nutritious dishes with cheese. Because I have a lot of zucchini and no meat (haven’t done the groceries!!! ), I will make this tonight! Mmmmm… I hope it forces Riley to take in more eggs. Hehehe.